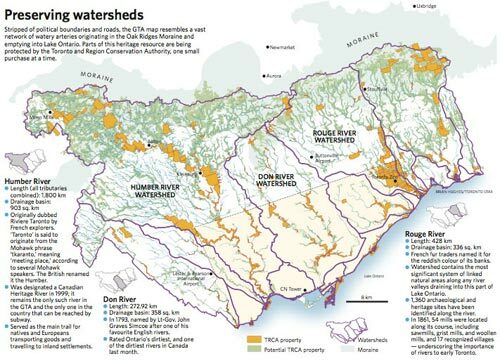 Along with its article today about the TRCA‘s work preserving watersheds in the GTA (Clock is ticking for conservation dream), The Star included a beautiful map of the major watersheds flowing south from the Oak Ridges Moraine through Toronto (click on the image for a larger version). The article describes some of the difficulties the TRCA is having in expanding its protection in the upper reaches of many of the watersheds. The original PDF (watch out, 9MB) can be downloaded from their site.